An extra squadron of Typhoons is due to arrive at RAF Lossiemouth before 2020. Firms are being scrambled to bid for the £100million contract for the overhaul of a north-east military base. A huge upgrade is planned at RAF Lossiemouth over the next two years to prepare for the arrival of new Poseidon P-8 spy planes and another squadron of Typhoons. Now the Ministry of Defence has invited bids from companies to tender for a major overhaul the base’s runways, taxiways and hardstandings. There are hopes the project, which is estimated to be worth between £50million and £100million, will lead to work for Moray firms. Runways and taxiways need to be strengthened and widened in order to incorporate the P-8 maritime patrol aircraft, which have been modified from designs for Boeing 737 passenger planes. Potential bidders have been told that the base will have to remain fully operational while the work is being done. 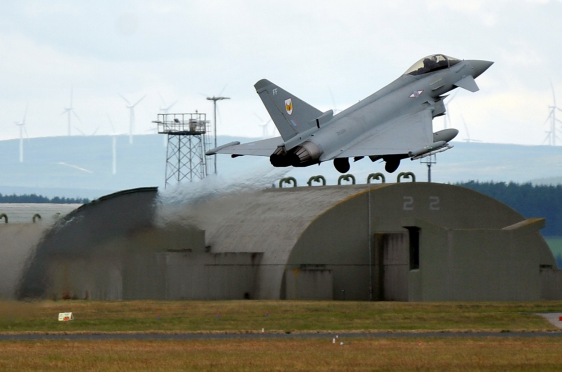 Yesterday, Moray MP Douglas Ross explained the complex RAF Lossiemouth development programme project (LDP), which will eventually total £400million, will create a legacy for the region. He said: “This contract is another sign of the massive investment we will see by the MOD and the UK Government over the next few months and years as they prepare for the arrival of the P-8s. “I’m hopeful that local businesses can benefit from some of the works that will take place during that time. The contract is expected to be awarded in spring next year with the work due to take about 18 months to complete. It comes a week after up to £870,000 worth of opportunities for subcontracted work to refurbish and extend the base’s gym were advertised. More than 400 extra personnel are expected to be deployed to Moray over the next two years with the Typhoons due to arrive in 2019 and the first P-8 expected to touchdown in 2020. A spokesman for the MOD said: “The LDP shapes the infrastructure requirement to deliver the work-strands announced in the strategic defence and security review in 2015.